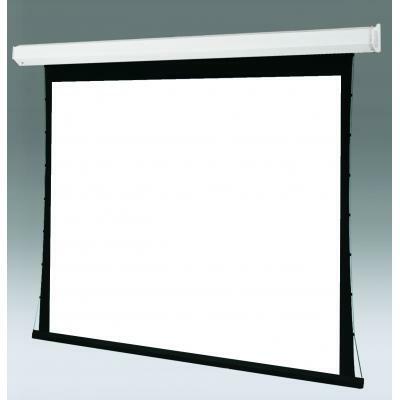 Premier (220V) Drapers most popular tab–tensioned motorized screen. The Premier is housed in a white pentagonal steel case and utilizes a tubular motor-in-roller design. The endcaps on the Premier are also it’s universal mounting bracket. Viewing surfaces from the OptiFlex, ClearSound and CineFlex families. Standard Specs •	Sizes and Formats: Custom sizes and formats available by quotation. •	Custom sizes need to be specified in detail, including extra drop, if desired. •	Case Dimensions: Standard case is 15cm H x 13.4 cm D, including endcaps with •	universal mounting brackets. •	Extra drop or masking will increase length of case.